To illustrate the value of the original M&M intuition, we briefly consider an expanded version of the pie model that we introduced earlier. 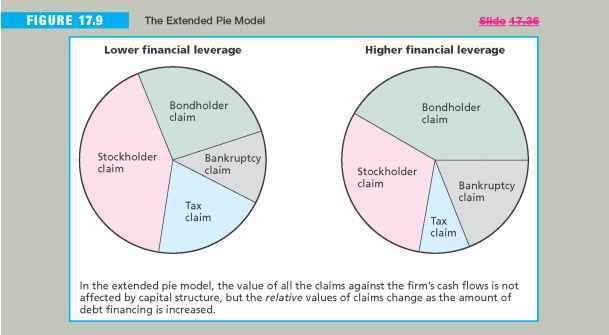 In the extended pie model, taxes just represent another claim on the cash flows of the firm. Because taxes are reduced as leverage is increased, the value of the government's claim (G) on the firm's cash flows decreases with leverage. Bankruptcy costs are also a claim on the cash flows. They come into play as the firm comes close to bankruptcy and has to alter its behavior to attempt to stave off the event itself, and they become large when bankruptcy actually takes place. Thus, the value of this claim (B) on the cash flows rises with the debt-equity ratio. The extended pie model is illustrated in Figure 17.9. Notice that we have added a few slices for the additional groups. Notice also the change in the relative sizes of the slices as the firm's use of debt financing is increased. With the list we have developed, we have not even begun to exhaust the potential claims to the firm's cash flows. To give an unusual example, we might say that everyone reading this book has an economic claim on the cash flows of General Motors. After all, if you are injured in an accident, you might sue GM, and, win or lose, GM will expend some of its cash flow in dealing with the matter. For GM, or any other company, there should thus be a slice of the pie representing potential lawsuits. This is the essence of the M&M intuition and theory: The value of the firm depends on the total cash flow of the firm. 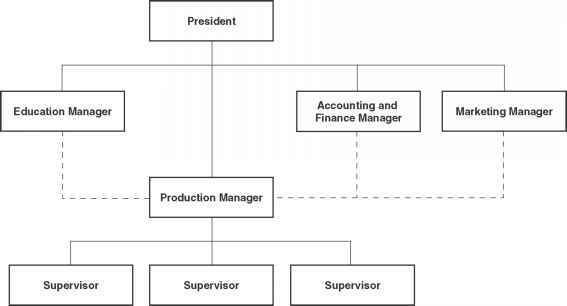 The firm's capital structure just cuts that cash flow up into slices without altering the total. What we recognize now is that the stockholders and the bondholders may not be the only ones who can claim a slice.